When the next day came and my condition was no better, the doctors suggested I be put into a medically-induced coma so that my body could better fight the infection. After being put into the coma and transferred to the ICU, my blood pressure dropped to critical levels, indicating that the infection that had started in my lungs had spread to the rest of my body (sepsis). The doctors finally decided I had fungal pneumonia, which is rare enough that I had a guy from communicable diseases hovering over me. I didn’t see him when he was there, but he introduced himself several times after I woke up. I spent six days in the coma, and then it took another six days to come out of the coma as much as opening a single eye. The next 78 days were spent in various hospitals and rehabilitation facilities. I was in six different rooms in three different facilities in three different locations (Virginia, Washington D.C., and Maryland). The biggest bummer of the whole thing was that nothing spectacular happened for me while I was out. There was no tunnel of light. I did not have great meetings with God and with deceased family members—at least, there was nothing I remember. I did not hear what Fluffy said to me when he was holding my hand, despite what the nurses told him. When I was out, I was out. If you ask how my Christmas and New Year celebrations were, the answer is simple: I didn’t have them. We put up the tree three days before I went in the hospital, and most of my presents were wrapped (but not mailed). That was the end of it for me. There was no Christmas dinner. I never heard “Messiah” on our stereo or went to the sing-along performance our stake put on. I didn’t sing a single Christmas carol. There was an hours-long Christmas hallucination, but it doesn’t translate to the computer screen. Fluffy brought me two presents for us to open on Christmas Day – a Marilyn Monroe calendar for him, and a handmade calendar for me. His handmade calendar is always one of my favorite Christmas presents, but I still haven’t looked at mine because the hospital room was too dark for me to see it, and I haven’t come across the calendar since. It has taken me weeks of physical therapy just to be able to move my arms and turn my neck. My legs are still a work in progress (and that’s a gross understatement), and I will be using a wheelchair for up to a year. I feel like a newborn baby who must learn to use her body for the first time, and who is dependent upon others for just about everything. As you might expect, spending 25% of a year in bed gives you a lot of time to think. One thing Mormons believe is that even bad experiences can teach you important things, and this was certainly true for us. My husband Fluffy and I have learned many things from this experience, and it has changed our perspective in so many ways. Most of those will be saved for future columns, but there was one thing that I wanted to pass along today. It amazes me how much support we get from our LDS communities. I’m not sure how non-Mormons can maintain their sanity without having a similar support system. I’m not saying that other faiths do not support their members, because I know that they do. But in looking over the experiences of the past three months, we are just so grateful for the prayers that have been offered in our behalf, and for the acts of service that have been rendered for us. For me, this service included hospital visits, encouraging cards, letters and emails, and multiple priesthood blessings. I had so many people inside my hospital room—even though I was in another state from where they all lived—that the hospital staff were amazed. They were not accustomed to seeing so many visitors in the room of one patient, but that’s the sort of thing that happens when you are a member of the LDS Church. These signs gave me a happy welcome home. 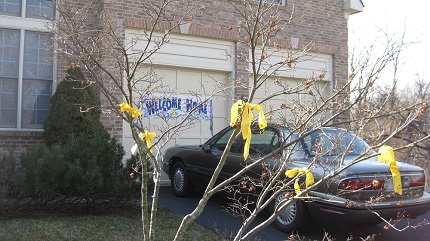 When I arrived home on March 5th—three months to the day after I was hospitalized—I found that my visiting teachers and Relief Society president had decorated our home with banners, ribbons and bows, and that was great to see. Ward members have brought in dinner every night since I returned, and this will continue through next week. I really thought that we didn’t need these, but with all the commotion of getting me home and settled, they have been a real blessing. The stream of visitors has continued since I arrived home, and it has been good to catch up on all the news I have missed. This was supposed to be another “welcome home” sign, but when the perpetrators unwrapped it, they saw it contained a different message altogether. 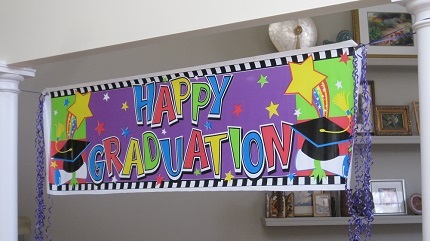 They put it up anyway, over the opening leading to our temporary bedroom. For Fluffy, the acts of service have included meals, invitations to dinner and social events (especially comforting during the holidays), help in getting our home prepared for my wheelchair, priesthood blessings, and treatment advice (from friends with backgrounds in medicine and rehabilitation). We are blessed to be counted as part of four LDS families. We have our ward members, stake members (many of whom are former ward members, or are those who we have met during stake activities), people we work with in the Washington D.C. Temple, plus the LDS online community. Members of all these communities have offered us service and support in many different ways. I suspect my name has been on the prayer rolls of many different temples. Many people have told us they have been praying for us daily, and that has been a comfort to both of us. Those who consider joining the Church often weigh the positives and negatives that will go along with their decision to be baptized. Obedience to LDS doctrines often requires much sacrifice on the part of new members, and sometimes their membership will cost them friendships, jobs, and even family associations. But millions of saints have made these sacrifices for the increase in light and knowledge that comes with membership in the kingdom. One of the greatest benefits is the friendship and support that comes to Latter-day Saints when they join our worldwide family. We truly are brothers and sisters, in the best sense of the word, and that is expressed each day in countless ways.